It seems there are a lot of people out there wondering how to get rid of snakes, mostly without handling them. I tell you what, things have changed a lot since I was a kid. When I was a kid we were the snake control professionals. I remember many a fine day grabbing garter snakes by their tales and throwing them up into trees to see if they’d stick. None of them ever did, and most of them died in the process—sorry Mrs. Johnson!—but there was never a snake problem where I grew up. Apparently things are different now, and getting rid of snakes is priority number one, and it isn’t easy. Why? Because they’re snakes, I mean, come on! They’re snaky? Anyway, whether it’s the common garter snake you’ve found slithering through your grass or a mean old diamond back holed up under your porch, the methods of controlling these snakes are pretty much the same. If you want to keep snakes out of your yard, you’ll want to make sure that shrubs, bushes, and thick gardens are kept away from your home. Snakes love gardens with lots of shrubbery. It gives them a place to hide and hang out while they wait for the next meal to come along. It also provides the snake with a perfectly safe way to travel from one place to another. Mowing your lawn will help you get rid of snakes. Tall grass is a great place for snakes to hide and move around in. Not only that, but tall grasses host a number of the snake’s favorite meals like crickets, grasshoppers, mice, and a plethora of other small rodents and bugs. Keeping the grass low also means that snakes will feel less comfortable there because they’re open to attack by their own natural predators like hawks and owls. Piles of wood, compost heaps, and mulch should be kept a safe distance from your home if you’re getting rid of snakes. As you might imagine, snakes are always looking for places to hide or cool off during the really hot days. The gaps between logs provide the perfect cover for snakes, as do compost heaps and piles of just about anything. By now you should understand that controlling snakes means removing their safe spots. Getting rid of snakes means getting rid of small rodents. If you have snakes consistently slithering through your yard, chances are they’re chasing a meal. This is why we find snakes in our garage, under our porches, and in our gardens: those are all places where rodents like mice, squirrels, and other furry like to find a meal or make a nest. Snakes know this, and it only makes sense to go where the food is. TO help with the rodents, you may want to try Eco-Defense Mice Repellent. 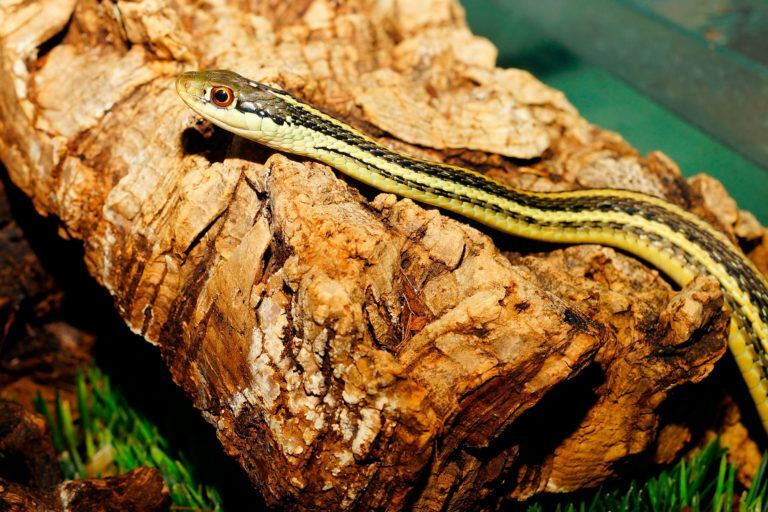 If you want to get rid of garter snakes, then keeping insects like crickets, grasshoppers, and other small bugs out of your yard is a good idea. Lord knows how to get rid of these things. There are so many types of insects, it’s impossible to get rid of all of them. In fact, if you’re having more problems with insects than with garter snakes, then it’s a good idea to just leave them alone and let them do their job—silencing those annoying crickets. Wash the snake bite with soap and water. Keep the snake bite below your heart. Wrap a bandage 3-4 inches above the snake bite. It should be obvious that if you see a snake of a species you don’t recognize, you should get your children away and call animal control immediately. Animal control officers are trained to remove snakes from yards or hard to reach places; unlike your husband, who makes a better victim than an expert. Sold by either Liquid Snake or by Ortho, these granules tend to be safe and no-stink. According to the Liquid Snake website of the all of the ingredients in their snake repellent are “on the EPA’s FIFRA 25(b) list of minimal risk ingredients.” Sounds safe to me, though I imagine some Greens out there would say differently. But if you’re wondering, Amazon sells Ortho Snake B Gon Snake Repellantgranules for $10/2 lbs. It’s slightly cheaper than Liquid Fence, even if their spelling is slightly worse. Apparently getting rid of snakes is easy with their snake repellent. It’s all natural and they claim that it uses nothing but bad smells and tastes to keep snakes away. It’s unknown what precisely those things are. Snake-a-way is a snake repellent that’s been on the market for a few years now. On a website that explicitly advertises snake-a-way as the primary solution to snakes, it says that a university study has proven sulfur does not to repel snakes and shouldn’t be trusted. What they fail to mention is that Snake-A-Way was the product being tested, which uses 28% sulfur. They think we’re morons.